In a way, it was a lot like looking at an old map of a vastly different but still familiar place. “I found it during the move,” says Mary Graham, senior vice president of public policy and regional advancement for the Charleston Metro Chamber of Commerce, passing a slightly faded, stapled document across the conference table. Only months earlier, when the chamber moved its offices to Leeds Avenue in North Charleston, Graham had turned up this bit of the region’s economic history. The simply titled “Recession Report,” dated July 31, 1979, had been prepared for the Charleston Trident Chamber of Commerce, assessing in 18 double-spaced, typed pages how the region was faring in the face of a national recession. “If you’ve got to be in a recession, there’s no better place to be than in Charleston, South Carolina,” enthused Howard C. Bowie, then-manager of Charleston’s Sears and Roebucks, in answer to the chamber survey. The optimism expressed by Bowie and others was supported by three factors asserted in the report: the “tremendous stability” of the half-billion-dollar military and government sector, the diversity of largely manufacturing-based industries, and the overall growth and development that had occurred during the previous decade. Trailing behind these in economic importance was tourism, an industry largely centered in downtown Charleston. At the time, a $400-million investment in a new Berkeley County plant by Alumax of South Carolina Inc., the aluminum ingot manufacturer, was being hailed as the largest single industrial investment ever made in the state. New construction projects underway in the region included several hotels, the Charleston Area Convention Center, Charleston International Airport, and the first phase of the S.C. State Ports Authority’s Wando-Welch terminal. “Things were humming along,” Graham says. Fast-forward to 2010, and while it’s clear some of the old economic mileposts remain, what’s most evident are the new routes to regional prosperity that weren’t even imagined three decades ago. In the past eight months, as the world struggled with an even deeper recession than chamber members confronted in the 1970s, the region witnessed not one, but several huge economic development announcements. The largest, of course, was The Boeing Company’s decision last October to build an assembly and delivery site in North Charleston to speed production of its 787 Dreamliner passenger jets. The venture is expected to create 3,800 jobs. Also in October, TBC Corporation, one of the largest marketers of automotive replacement tires, decided to locate a 1.1-million-square-foot distribution center on land being jointly developed by the Rockefeller Group Development and MeadWestvaco (MWV) near Jedburg. Once completed in December, the distribution center is projected to be the Port of Charleston’s fourth biggest customer, according to MWV community development and land management president Ken Seeger. Then, in November, Clemson University Restoration Institute secured $98 million in funding to build a large-scale wind turbine drivetrain testing facility here, placing the region on the cutting edge of the renewable energy movement. Could it be that Howard Bowie is still right after all these years? In reviewing the last three decades, the story of contemporary Charleston’s economy is one of resilience and a rebirth few could have possibly imagined in the waning days of President Jimmy Carter’s administration. 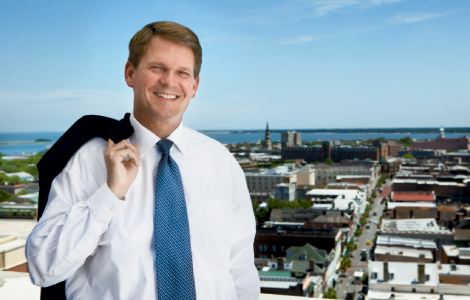 David Ginn is president and CEO of the Charleston Regional Development Alliance, which was formed in 1995 to help local government and businesses strategize for sustainable economic growth in the Tricounty region. Talk to almost anyone in business and economic development in the region today, and they’ll tell you that the region’s turning point was Congress’s 1993 decision to close the Charleston Naval Base & Shipyard. Until then, the Lowcountry had largely stayed on the sidelines of the business recruitment and development boom that was creating a “New South” with Atlanta as its focal point. “The Navy Base decision was really the wake-up call, and the community leadership—both private and public—quickly realized that something drastic had to happen if we were going to survive,” Graham says. The chamber also hired Ross Boyle, a nationally renowned consultant and head of the Reston, Virginia-based Growth Strategies Organization, Inc., in 1994 to develop a strategy to offset the base closure-inspired crisis. His two reports found the local economy relied too heavily on the federal government and tourism and stressed the importance of striving for economic diversity. Boyle also expressed profound concern about education, calling for improvements in the region’s primary and secondary schools and for enhanced opportunities for technical training. The reports galvanized the community. But an even more critical juncture was reached a decade later, when CRDA hired Austin, Texas-based consulting firm Angelou Economics to take a fresh look at the area. Its report, “Forward Charleston,” recommended using the region’s inherent advantages—among them, the port, the Medical University of South Carolina, a strong military presence, and an attractive lifestyle—to build a network of complementary industry structures. These included the aerospace, biosciences, automotive, advanced security, and creative industries. 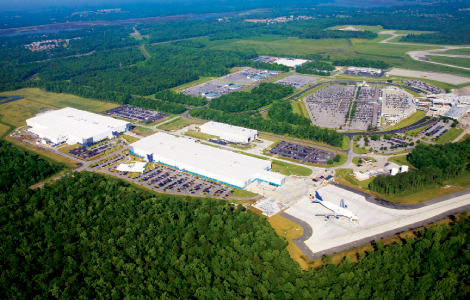 Having purchased Vought’s North Charleston facility in 2008 and bought out the Global Aeronautica joint venture in 2009, Boeing announced plans to build its second 787 final assembly facility last October. Production will begin in one year, and the first 787 Dreamliners are scheduled to deliver in the first quarter of 2012. 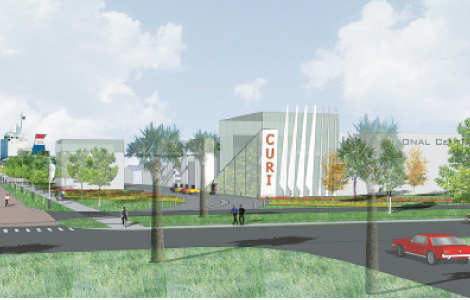 A rendering of the Clemson University Restoration Institute, which will be capable of testing next-generation wind turbines. Director of business development Elizabeth Colbert-Busch (below) believes CURI will become the hub of a new economic cluster, renewable energy. Just down the Cooper River, a similar air of confidence and long-term vision permeates the offices of the Clemson University Restoration Institute (CURI), currently being developed on 100-plus acres of the former Charleston Naval Base. Initially identified with the restoration work being performed on the C.S.S. Hunley at the Warren Lasch Conservation Center, the institute’s mission became all the more focused last year when it received the funding to create a wind turbine drivetrain testing facility. Last November, the U.S. Department of Energy provided $45 million for the project, with another $53 million in public and private matching funds. Housed in a former Navy warehouse adjacent to existing rail- and ship-handling infrastructure, the facility will be fully capable of testing next-generation wind turbines that are up to five times larger than any in the marketplace today. Elizabeth Colbert-Busch, the institute’s director of business development, sees the massive project as complementing Clemson’s research in advanced materials, restoration ecology, and resilient infrastructure. She also believes the facility will make the campus one of the most important sites for wind energy research and development in the country and hence a magnet for companies working in the field. Within days of the testing facility’s announcement, IMO Group, a German company that makes wind turbine parts, announced it was opening a plant in North Charleston later this year, creating 190 jobs. And Colbert-Busch boldly predicts many thousand more may be just around the corner. “From the time the City of North Charleston and the Charleston Naval Complex Redevelopment Authority gave this property to Clemson to conduct the metals conservation work on the Hunley, this institute was clearly seen as an economic engine,” she says. Down on the peninsula at the Medical University of South Carolina, MUSC president Dr. Raymond Greenberg also has his sights on being a cornerstone of the “innovation economy.” The university is in the midst of a strategic planning process that Greenberg says will more strongly align the institution with the region’s economic development goals. Its focus includes fostering entrepreneurial and interdisciplinary activities, innovation and technology, and globalization. That’s not to say MUSC’s Foundation for Research Development—the office charged with moving its research into the commercial arena—hasn’t already enjoyed some successes, such as spinning off Micrus Endovascular, a San Jose, California-based, publicly traded medical device manufacturer, and licensing technologies to a number of other established entities. But Greenberg believes the institution still has a long way to go in technology transfer. “We need to create a culture in which developing commercially viable products and entities is valued and rewarded,” he says. Greenberg points to the state’s endowed chairs program—also known as the Centers for Economic Excellence, on which the university collaborates with both Clemson University and the University of South Carolina—as one mechanism for doing that. 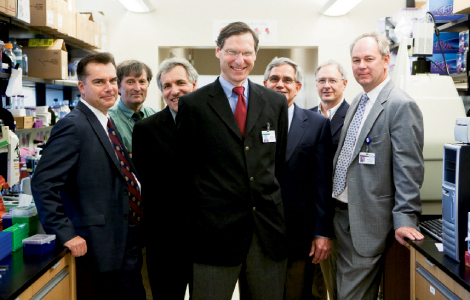 “It has allowed us to bring in a number of outstanding faculty who are helping to build the competitiveness of our research programs while also driving improvements in medical care and our commercialization potential,” he explains. Unfortunately, Greenberg says, the program, which began in 2003, has not received additional funding during the last three legislative cycles and is now almost out of money. In part, the lack of new funding reflects the general decline in state appropriations, but some legislators also have questioned the return on the investment. Elected officials tend to measure results in two-year election cycles, whereas transforming an economy takes much longer. Greenberg thinks that a longer-term view is required. “North Carolina started building its Research Triangle Park 60 years ago,” he says. “Most of our investments have been made within the past decade, and they are not going to show dramatic outcomes for some time. 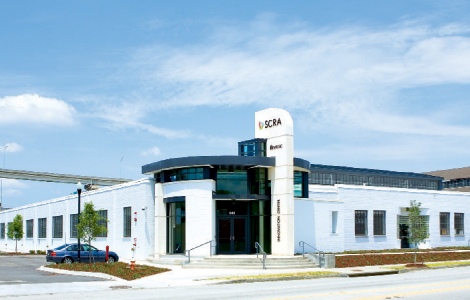 The SCRA MUSC Innovation Center opened at 645 Meeting Street in December 2009 as a “birthing place” for biotech and biopharmaceutical companies. It currently houses five tenants from MUSC, start-ups that are developing new products, from biofuels to treatments for cancer. Of all the business recruitment success stories of recent years, no doubt the biggest in terms of brand name status and international reach is Google’s 2007 decision to locate a data center in Berkeley County. But as with Boeing, the lingering question is what the add-on effect of Google’s presence will be. Matt Dunne, Google’s U.S. community affairs manager, says that unlike a manufacturer, data centers don’t need local suppliers for the specialized products they require to function. But “a data center creates a critical mass of people who have a certain level of technical skill,” he says. He points out that a few years after Google built a data center in Lenoir, North Carolina, Apple announced that it was also building one in the same part of the state. “Now, I can’t say whether or not the two are related, but I think that’s a signal that other companies are looking at where we’ve sited data centers when considering locations for their own,” he says. Much of that activity, in fact, is transpiring not far from Google, at the Space and Naval Warfare Systems Command in Charleston (SPAWAR). A vestige of the military presence on which Charleston’s old economy relied, SPAWAR quietly employs more than 10,000 engineers in support of the nation’s war fighters. Those efforts have morphed into the realm of homeland and cyber security with a helping hand from ThinkTEC, an initiative of the chamber that hosts an annual Homeland Security conference. “It’s our way of advancing the knowledge-based economy while placing a spotlight on the diverse companies that work in this sector,” explains Pennie Bingham, the senior vice president of the chamber who oversees the initiative. Among the chamber’s partners in this effort is the South Carolina Research Authority (SCRA), which opened its flagship Innovation Center on Upper Meeting Street last December to serve as a “birthing place” for biotech and biopharmaceutical companies. The 28,400-square-foot facility is home to 11 wet labs and 8,000 to 9,900 square feet of office space. Since taking the helm of the South Carolina State Ports Authority last October, Jim Newsome has set his sights on growing the port’s services to Asia, rebuilding the cruise ship terminal, and redeveloping Union Pier. Across the peninsula in his Concord Street office overlooking Charleston Harbor, Jim Newsome offers his fresh perspective on the time-honored local shipping industry. 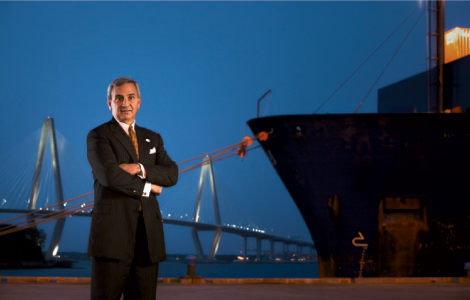 The former president of one of the world’s premier shipping lines, Hapag-Lloyd (America), Inc., Newsome took over the reins at the S.C. State Ports Authority 10 months ago, at the depth of what had been a difficult few years for the Port of Charleston. Despite a stellar reputation for operational efficiencies, the Port of Charleston had struggled through the middle aughts, mainly due to the Port of Savannah, which had begun capitalizing on its proximity to vast amounts of surrounding vacant land available for distribution center development. By the time the recession hit, Savannah had surpassed Charleston as the fourth busiest port in the nation. When the global economy tanked, Charleston’s fortunes followed suit. “I thought it would be a good challenge to bring the port back, and I thought the raw material to do so was here,” Newsome says. Since the first of the year, cargo volumes have surged through Charleston, increasing as much as 24 percent per month. In 2015, a widened Panama Canal will open for service, enabling the largest of cargo ships sailing from Asia to call on East Coast ports with ease. “The Panama Canal is the game changer, bringing a wealth of new opportunities,” Newsome says. Historically, Charleston has been “a very Euro-centric port,” he notes. In anticipation of the widened canal’s opening, the port’s marketing and sales team is focused on growing Asian services. But luring big ships laden with cargo isn’t the only activity at the Port of Charleston bound to have a long-term impact on the region. In May, a new era of tourism opened in Charleston with the arrival of the 2,056-passenger Carnival Fantasy, which calls on the port year-round. It joined the Celebrity Mercury as one of two cruise services that consider the Holy City a home port. At present, a total of 67 cruises are booked to embark from Charleston in 2010, with an equal number scheduled for 2011 and 2012. In the meantime, a far greater priority for the new president and CEO is the completion of the new $600-million terminal at the former Naval Base. To date, the authority has spent more than $100 million on the project, but a legal challenge by the S.C. Coastal Conservation League (CCL) has delayed the issuance of new contracts. The CCL sued over concerns that regulators failed to adequately consider air quality impacts from the new terminal and the trucks that will serve it. A related issue is whether the Ports Authority fully vetted options for rail access to the new terminal when it applied for state and federal permits in 2003. Moving cargo by train is considered cleaner and more fuel-efficient than trucking, and theoretically would reduce traffic congestion on interstates-26 and -526, according to rail advocates. Hoping to capitalize on the rail debate is the dramatic rise of a distribution hub near Jedburg, a byproduct of companies rethinking their distribution networks and acknowledging the need for warehousing as close to the coast as possible to boost the efficiency of their operations. MWV, the largest private landowner in the Tricounty region, determined that a fraction of the land had development potential and led to their real estate business to drive development and job creation in “appropriate” locations. As talks about the sale of the 400 acres—known as the Gibbs Tract—progressed, both sides realized they wanted more than a simple seller/purchaser relationship. “We have a shared vision of the future,” says Ed Guiltinan, Rockefeller Group vice president and regional director. 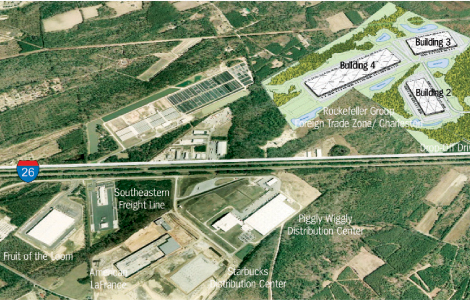 The two companies are working closely on the remaining acreage at Rockefeller Group Foreign Trade Zone/Charleston as well as other tracts around the region, allowing the partners to accommodate the specific needs of prospective clients. Guiltinan says that having a burgeoning distribution center area near I-95 will enable the port to grow by affording its clients “big box” institutional-quality industrial facilities, which had been lacking in the market. But even the finest of road maps can’t prevent the occurrence of obstacles, and local business leaders point to three primary areas of concern: road congestion, education, and the absence of a discount air carrier. The latter was resolved by Southwest Airlines’ announcement in May that it will begin flying out of Charleston in March 2011. Education, however, seems to be the more worrisome of the remaining two. 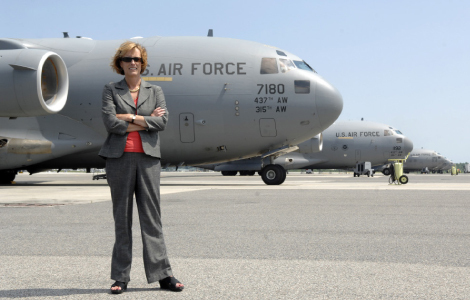 Anita Zucker, chairwoman and CEO of The InterTech Group and a longtime education advocate, says the Boeing announcement was a particularly galvanizing moment. “How are we going to be able to provide a workforce that can step in and do this work? Education and economic development go hand in hand, but I’m not sure that’s a message our legislature gets,” she says. “Our elected officials speak regularly about creating jobs, but are they thinking about how we are going to provide the labor?” In response, Zucker championed the formation of a workforce development group comprised of members of the chamber, CRDA, and the Education Foundation, as well as the management of several local companies. Sharing Zucker’s concerns is Trident Technical College president Dr. Mary Thornley. The school has experienced double-digit growth in recent years. In fact, the biggest change in the student body has been in its average age—now 28—and the number of students seeking certification in a specific job skill or discipline. Simultaneously, however, the college has lost close to $1.4 million in state aid. The chamber is also moving in a new direction, reviving the S.C. World Trade Center, after its board voted to dissolve the organization last year, and reestablishing it as World Trade Center Charleston. Bingham describes the move as both a nod to the organization’s past—it’s the nation’s oldest chamber and one founded on the fortunes of international trade—and recognition of the global opportunities for some of the region’s smallest companies.